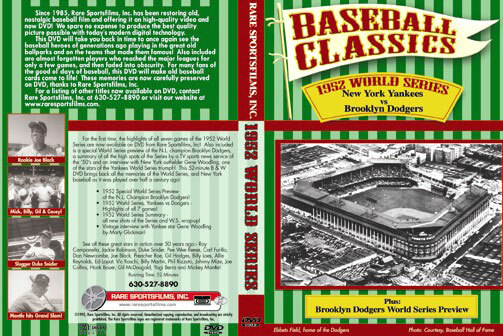 Now for the first time ever, a whole 52-minute tape is available containing all the highlights of every game of the 1952 World Series, plus a World Series preview of the National League champion Dodgers, a summary of all the high spots of the series by a TV sports news service of the 1950's and an interview with New York outfielder Gene Woodling, one of the stars of the Yankee World Series triumph! First you'll see a rundown on the 1952 National League pennant winners. Shown in never-before-seen closeup shots are Brooklyn manager Chuck Dressen, rookie pitcher Joe Black (15-4, 2.15 mostly in relief), Roy Campanella (22 HR, 97 RBI), Carl Erskine (14-6, 2.70), veteran Preacher Roe (11-2), Billy Loes (13-8, 2.69), Gil Hodges (32 HR, 102 RBI), rightfielder Carl Furillo, shortstop Pee Wee Reese, Jackie Robinson (.308, 19 HR), Andy Pafko (19 HR), outfielder George Shuba (.305) and Duke Snider, who hit .303 with 21 HR and 92 RBI during the regular season. Following the official 1952 World Series film by Major League Baseball (long version) is a short version or World Series wrap-up, produced by one of the national sports news services of the early 1950's. This contains short highlights of all seven games and provides new footage now available on video for the first time ever! Finally you'll see a 1953 interview with star Yankee outfielder Gene Woodling, as he talks baseball with Marty Glickman and looks back on the 1952 World Series several months later. Game 1 at Ebbets Field: Joe Black vs Allie Reynolds - Jackie Robinson's leadoff HR in the bottom of the second scores the first run of the series. Gil McDougald's solo HR ties score at 1-1 in the third. Duke Snider's HR with Reese on base gives Brooklyn a 3-1 lead after six. Woodling PH's triple and scores Yanks second run, but Pee Wee's HR finishes the scoring. Young Joe Black's 6-hitter gives Dodgers a 4-2 win in the opener. Game 2 at Ebbets Field: Vic Raschi vs Carl Erskine - Raschi 3-hits Bums while striking out nine and Billy Martin crashes a three-run HR in the Yanks 5-run 6th, as New York evens the series. Game 3 at Yankee Stadium: Preacher Roe vs Ed Lopat - John Mize's ninth inning HR simply adds a run in a losing Yankee cause, but is an omen of big things to come. Roe's 6-hitter beats Yanks 5-3. Yogi Berra HR in 8th. Game 4 at Yankee Stadium: Allie Reynolds vs Joe Black - "Big Jawn" Mize slams his second solo HR of the series in the 4th. Meanwhile, Reynolds tosses a 4-hitter and strikes out 10 to bring the Yanks even again in the series. Berra, next up after Mize's HR, is robbed of a homer by Duke Snider, who leaps at the right center scoreboard to haul in Yogi's drive. Mickey Mantle slams a triple to the 461-foot marker in CF in the 8th and scores on a wild relay throw to 3B. Game 5 at Yankee Stadium: Carl Erskine vs Ewell Blackwell - Erskine pitches all 11 innings and no-hits the Yanks in 9 of them (not consecutive) enroute to a 6-5 Brooklyn victory. Two spectacular Dodger catches highlight this exciting game! With the Dodgers leading 1-0, Andy Pafko snags Gene Woodling's bid to tie it up in the Yankee second. Duke Snider's 5th inning HR with Erskine on base raises the score to 4-0 Dodgers. In the Yank 5th, Mize's 3-run HR (his third of the series) is the big blow in a Yankee 5-run outburst which lifts them into the lead, 5-4. With the score tied 5-5, Duke Snider's 11th inning double scores what proves to be the winning run. In the last of the 11th Carl Furillo robs Mize of a game-tying homer (it would have been his 4th of the series) with a leaping catch at the wall to save the game for Brooklyn! Game 6 at Ebbets Field: Vic Raschi vs Billy Loes - Duke Snider's home run high over the Esquire Boot Polish sign in right field breaks up a scoreless deadlock in the Dodger 6th. Berra's 7th inning home run ties the game. With New York leading 2-1 in the 8th, Mickey Mantle smashes a drive to left centerfield which drops in behind the Stadlers sign to the left of the 393-foot marker. In the Dodger 8th, Snider slams his second HR of the day (his 4th of the series) just to the right of the scoreboard, but Bums bow, 3-2. Game 7 at Ebbets Field: Ed Lopat vs Joe Black - Gene Woodling's solo home run in the 5th inning gives the Yanks a 2-1 lead. With score tied 2-2 in the 6th, Mantle's clout over the right centerfield scoreboard gives Yanks 3-2 lead, and his RBI single in the 7th gives New York a 4-2 cushion. The climax of the game and the series occurs in the Dodger 7th. With the bases loaded and one out, Yank reliever Bob Kuzava gets Snider to pop up a 3-2 pitch. Next batter Jackie Robinson also pops up but when first baseman Joe Collins loses the ball in the sun, hustling Billy Martin makes a spectacular knee-high grab after a long run to retire Brooklyn and save the series for New York! You can get your own copy of this rare film footage all on one tape for only $29.95 plus $5.00 for shipping and handling (Illinois residents must add $2.00 sales tax).